I went on some explorations this June, and this is the roundup of some observations and photographs made in the first month of this exclusive season. I visited Nagla Block after two years, on June 11th. I’ve boasted about this place a few times, but I seem to fall short of words when I’m actually there. This small corridor is very different and better preserved than main SGNP. The day began with a heavy downpour, and it continued to rain throughout the four hour hike. After reaching home, I realized it was the wettest day so far of 2011. When it rains, it’s difficult to focus on animals – most are either into hiding or most of the time we’re protecting our camera from the rain, so the opportunities are rather less. Nonetheless, we saw some interesting flora and fauna as the monsoon released its bountiful reserve. ﻿﻿The insects were not as common as was expected from in this weather. But seeing four species of Hesperiids on a dark, wet day is something. I saw this unusual Chestnut Bob (identified on Butterfly India) that had lost all of its scales, probably by the torrential rain. I also saw what may have been a Conjoined Swift (also identified on Butterfly India) that wouldn’t let me come any closer. Then there was a Golden Angle hiding ‘neath the leaf, and another Skipper who wouldn’t sit at one place. ﻿A tiny little Praying Mantis nymph had also decided to hide underneath the leaf surface, as its distant relatives – the Cockroaches were seen go helter-skelter in the leaf litter. Leaf Beetle, probably Clytra sp. Crematogaster ants believe in team work! Harvester ants busy building a fort, brick by brick! ﻿Just a few meters from this was a battle for survival unfolding, as a scorpion got hold of a land crab’s leg and retreated in its burrow. I’m not sure if the crab got stung and if it survived. I did not get any pictures either. And a few meters from here was a castle being built – the Harvester Ant’s nest, as some workers softened the mud and plastered the walls, while some brought in food. Harvester ants are so called because they harvest seeds, and often near a nest, you may see the husks piled up. The shape of their nests is really curious, but I haven’t found any research that looks into its unique architecture. ﻿On the way ahead, I saw a few Crematogaster ants on a small Acacia pennata sapling, attracted to a small bulge on a rather slender stem. But this was no ordinary bulge, rather a perfectly camouflaged caterpillar. And these ants had a reason why they were so drawn to it. The caterpillar belonged to Common Acacia Blue, a common, but not-so-commonly-sighted butterfly in the family Lycaenidae. Many, rather most species in this family have a special interaction with ants in all sorts of ways; this relationship is called myrmecophily. I Found Butterflies has a pictured documentation of its lifecycle. ﻿Praying Mantises are not uncommon in these forests. You are bound to see a few on a trail through Yeoor, or any part of Mumbai. I came across this large nymph sitting quietly on a leaf. This Mantid was easily several weeks old, in fact I think it must have come out of the ootheca quite before the monsoons set in, and his mother must have laid the several thousand eggs encased safely in the ootheca in winter or summer months – in the scorching heat of Mumbai. This month, the mantid will definitely enjoy the abundance of prey such as flies, beetles, butterflies and moths. What’s also interesting to note is the colour of this mantid. Although it depends on the species, it also depends on the time of the year. The browns of this species must have been perfect in the summer, and they will continue to be in the monsoon months, unlike those that are green which need to be more careful while selecting a place to hunt. The spider diversity was quite low. A few Leucauge sp. are starting to build orb webs in the shaded regions, as more and more Scytodes sp. are beginning to fold leaves. And as monsoon progresses, the Leucauge will remain until the beginning of winter, whereas the Scytodes will disappear as soon as the rains vanish. There were five types (all different species, I think) of Jumping Spiders on the forest floor. ﻿The Jumper slowly approached the fly from behind and pounced on it from behind. It bit the fly, but the fly managed to escape with a strong jerk. The Jumper did not give up. After two more strikes, it finally got hold of this Robberfly – and the rest was history. Such natural history moments are continuously taking place in undergrowth. Both of these are superb hunters, but the Jumper had an upper hand over the Robber that had a rather soft cuticle, with wings not fully unfurled and practically no defenses at this stage in its life. ﻿It is a non-venomous snake in the family Colubridae. 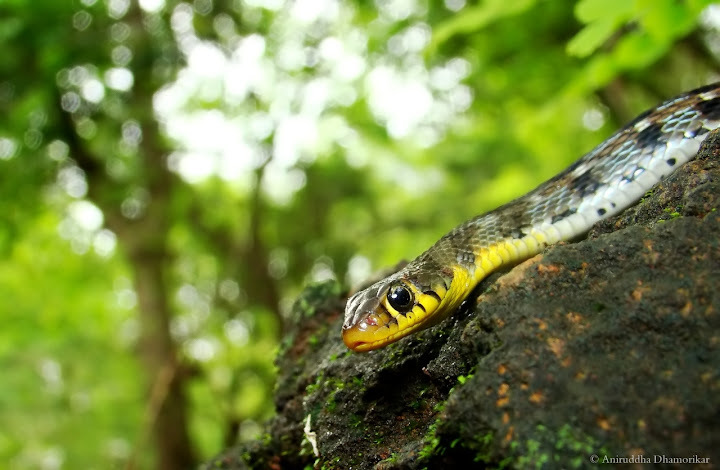 There are several keel-backed snakes in Mumbai, some of them such as the Checkered Keelback, Green Keelback and this fellow being the most common. This fellow was kind enough to let me photograph it up close without being aggressive. Last Sunday (June 26), I and a few friends visited Yeoor again. The morning was fine and bright, but as soon as we entered the forests, the clouds moved in and darkened the landscape. It was cold and breezy, but dry for the most part. We did not go very far, and called it off at around 9:30 am. Nonetheless, this short two hour walk was very pleasant. All the Holarrhena pubescens trees, the food-plant of Atlas Moth, are flowering, and so are Microcos paniculata that are all along the path, on which I found a myriad of insects – from Horseflies resting in the inflorescence, to spiders lurking beneath the leaves. One of the many Cicadas - Tibicen sp.? ﻿The butterfly diversity hasn’t changed since last Sunday. Common Leopard, Pierrot, Indian Crow, Baronet along with a Glassy Tiger were the only ones seen today, but we did see two caterpillars of the Common Acacia Blue. This time, we spotted an older instar than the one photographed last Sunday. It was also being tended to by Crematogaster ants, but the caterpillar did not seem to be providing them with the sugary treat from its glands. The caterpillars, interestingly, were sitting on little openings (or glands) on the stems of Acacia sp., which is where the ants, primarily Crematogaster sp., get their daily dose of sugars from. This “gland” on the plant is a special adaptation by the plant, probably to attract ants that will deter predators such as this caterpillar, but I think the caterpillar is smarter, and has found a way to drink from these glands and then indirectly provide it to ants. This is an excellent example of a complex mutualism as well as parasitism type of relationship between a plant, an ant, and a butterfly. The spiders were also under our observation, and the Jumping Spiders were the most common – probably more diverse in species than Araneae. This little ant-mimicking Jumping spider was kind enough to pose for a few photographs. This is a male, identified by the long pedipalps extending just in front of its eyes. I had photographed a similar ant-mimic in 2009, which I think was a female of this species. These spiders seem to mimic the Polyrhachis sp. of ants, which are very common at Yeoor. There were several others, mostly unidentified, Jumpers, including a female of Telamonia sp. We also sighted a large Jumping Spider that got hold of a Hersilia sp. (the Two-tailed Spider), midair from a mango tree. Unfortunately, they were too high up there and the wind too strong to photograph them, but I did get a blurry shot showing the Jumper’s eye-pattern and the Hersilia’s two long spinnerets. I was very much glad to discover so many animals as well as observe some interesting activities in the undergrowth. I was so engrossed that I barely ever looked up to the sky. I might have missed large raptors flying right above me, but the world hidden in plain sight is also equally interesting. As June gives the way for July, many more interesting creatures are going to surface. Keep watching this space for more exclusive Monsoon Trails! Gorgeous! I totally related to your feeling of being so engrossed in the ground and barely looking up at the sky. We experienced a similar feeling at Agumbe two weeks ago, when we visited the Rainforest Research Station. We have a whole series of our finds there but I love the fact that you know so much about what you have seen. Thanks for posting. I am avid follower. Glad you could relate Beej. Agumbe has always been on my wishlist and I've heard a lot about the RRS. Thanks for reading! Thank you for visiting John! What a great series of photos and stories Ani! Love the teneral robber fly being stalked by the salticid!